The Indiana County Recycling Center (Center) is located just off route 119 North in the town of Homer City, PA. Operated by the Indiana County Solid Waste Authority, the Center was created in 1988 to help Indiana County comply with Pennsylvania Act 101, the Municipal Waste Planning, Recycling and Waste Reduction Act of 1988 (Act). The Act governs how cities and counties in the Commonwealth provide for the management and disposal of municipal waste. The day-to-day operations of the Center are carried out by seven Members of UMWA Local Union 1412. The Union has been representing the workers at the Center since November of 1997, when the employees first decided to organize a Union at the facility. Members of Local Union 1412 arrive at the Center around 7:00 a.m. to begin their work day. Mike Bowersox has been a Member of the UMWA since he first started at the Center eleven years ago. He became involved in the Union shortly after getting hired and is currently a member of the Safety and Grievance Committees at the facility. When he started work, Brother Bowersox separated materials in the plant, a job known as a picker. In a short period of time he became a truck driver, the job he continues to do five days a week. The Center remains open 24 hours a day, seven days a week, for area residents who wish to drop-off materials during nonworking hours. It also provides satellite locations for individuals living in more rural locations who wish to participate in the recycling program. Drivers trans-port dumpsters to designated locations throughout the County, retrieving them later to process the contents. “The UMWA is proud of the diverse Membership we represent. Every day vast amounts of material arrive at the Center. They include a variety of recyclable products, such as aluminum cans, cardboard, newspapers, magazines and plastic bottles. 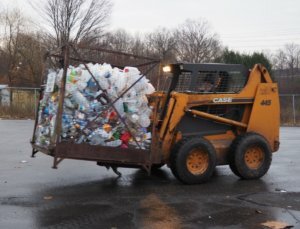 When the material arrives on-site, ether by truck or at the residential drop-off area, they are placed in bins or piles inside the center for sorting, the first stage in the recycling process. 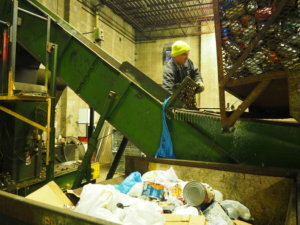 The aluminum cans are placed on the conveyor belt to be crushed and packaged. Plastic, cardboard and paper products are placed in a machine and packaged into bails. In addition to the other services the Center provides to County residents, they also offer designated appliance and electronics drop-off times, special materials collection, as well as training classes to help educate residents on the importance of recycling. One of the most popular services offered is the composite materials site. Residents can drop off grass clippings, brush, leaves, Christmas trees or other materials suitable for compost at the Center. for a fee of five dollars if John Doyle or another UMWA Member loads it with the skid loader. 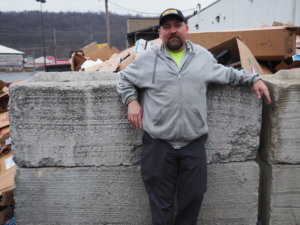 “I just can’t say enough about the dedicated Members of UMWA Local 1412 who work hard every day at the Indiana County Recycling Center,” said President Roberts. “They perform a variety of services day-in and day-out that are vital to the community.